I am a busy person – that much is obvious from my blog (unless it’s a clever double-bluff, and I’m actually at home all the time, sitting in front of the TV in my pants and watching The Wire). The upside of being busy is that I get to go to a lot of gigs, do a lot of fun stuff and meet a lot of people. The downside is that I rarely get to spend any quality time with them. Thgis becomes doubly difficult when I’m attempting to meet up with someone who is just as busy as I am. I’ve spent over a year trying to go for a drink with Mark Stevenson -who describes himself on his Twitter feed as a “Comedian, Author, CEO, Futurologist”. To be honest, that makes him sound like a bit of a wanker (sorry Mark – it’s the last two…), but he certainly isn’t. 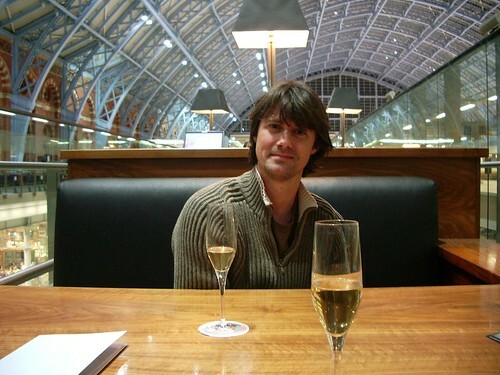 After months of long-range diary scrutiny and last-minute cancellations, we finally met on Tuesday for champagne in St Pancras station – the world’s poshest bar built in what is basically a giant shed – and he told me all about his new book project: An Optimist’s Tour of the Future. It’s basically a counterweight to all the doom and gloom in the world. It’s too easy to believe that we’re all heading to hell in a handcart and there’s nothing that can be done about it. Is the planet really fucked? Can we escape the threats of climate change? Will we ever find a cure for cancer, ageing or degenerative diseases? Cynics and pessimists say no, but Mark’s been travelling the world talking to people who think we can. You should read his blog – it’s inspiring. He was one of the few lucky bastards people who got to attend the underwater cabinet meeting in the Maldives, and he’s spoken to the men who believe we could solve climate change by scrubbing carbon out of the sky. This isn’t pie-in-the-sky “Oh it’ll be fine, the scientists will sort it out and we can just continue living our merry lives however we like” blind optimism. Mark describes himself as a pragmatic idealist, using optimism as a motivating force for making positive changes – and believing they’ll make an impact, however big or small. More power to his elbow, and I can’t wait to see the book when it comes out. And while you’re there, check out his enlightening Idiot’s Guide to Co2 and Global Warming, involving hot sauce, Stevie Wonder and a fat man covered in baby oil. Genius. This entry was posted in General bimbling, Science, Writing. Bookmark the permalink.